The National Park Service is making plans to manage Rocky Mountain goats in the Dinosaur National Monument. And by manage, they mean relocate or kill. The non-native goats, that are kind of native to the Rockies but not enough to matter, carry diseases that are harmful to sheep of the bighorn variety, elk and deer, and are a threat to the monument’s ecology, feds say. While native to the Northern Rockies, mountain goats were purposefully introduced into previously unoccupied mountain ranges for hunting and general recreation and enjoyment by both Colorado and Utah state wildlife agencies. 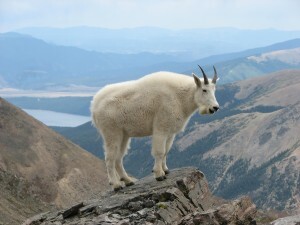 Mountain goats are considered by NPS policy to be a non-native species and require proactive management action to protect sensitive and/or endemic plant and animal communities. Apparently these goats have been wandering in from Utah about 50 miles west of the monument. The park service is now asking for public comment on how to dispose of the little beasties. Folks on the Western Slope better get on this problem and get their comments in before national animal activists are alerted and flood the process with Astroturf lobbying comments. If you don’t act now, we’ll see that goat declared as a nativish species that deserves special protection at the expense of native, native herds of elk, deer and sheep, plants and human. Submit comments online here by March 9, and stay tuned. F_uck DOW, need introduce wolves to eat the Californias and the sheep!